Real Estate in a Virtual World | 2P START! I really hope this redeems us for last week because I didn’t get nearly enough sleep last night! I like to think of how the economic downturn might affect different video game characters in their respective worlds, and the housing market seemed like a good place to start. There were more ideas we just didn’t get to, but I think that’s alright because there are tons of jokes hidden throughout. Enjoy! Haha, awesome. All of the little jokes plus references to two of my favorite games (LA–I liked “dreamy” Koholint Island, although I don’t think the house is really that big–and Super Mario World–I like the “No Yoshi” sign) mean I love this comic. I also like the sneaky self-references like the cost of the AC house and comment on the residents. This is probably my favorite comic of yours in recent memory. I really like this comic. Simple joke, excellent execution. I really liked the pun at the very end, “No browsers.” I am sure there are a bunch of other little jokes like this I need to go back and find that I missed on my first run through. Good job guys, redemption earned. Tons of little jokes and a real good execution. I wouls say one of my favourite is the price for the castle, but there’s lots there. Ha ha! 1 Bajillion Bells! That’s from comic #093 Tom Crook! The only problem is that that qualifies as predatory lending. Whether or not this comic is a classic, I think is yet to be determined…but I can say for a fact that this is definitely the most unique comic I’ve ever seen on this site. This comic is a definite win…I chalk this one up to Tim…looks like there were jokes-a-plenty on this one, so I’m assuming Tim put in an extra dose of effort…am I right? Holy crap, eggplants are a strong currency. Better move my money from those Swiss bank accounts to the Arctic banking system. I especially like the condor in the background of Popo Place (and with Brawl’s aurora sky instead of the regular Ice Climber black sky no less) and the Angry Sun makes a nice cameo. I’ll take the 666 Spooky Lane one if not taken already. Might rent its rooms, open a haunted house attraction, or actually stay there and reaserch on ectoplasmic energy, while finding the last Boo I never been able to get in the backyard. And I can just blow it up all I want, I’m sure it will repair itself. as for feedback comment now: different from what I’m used to, making real estates from different video games with punfull description, decent comic. I really should register, but I’ll get around to it later. Been hooked on your comic since I stumbled upon it when the “Venom symbiote + Wii = PS3” comic was up, and look, I’m finally commenting!! So, what is the currency for the SMW castle price? I can’t tell. 🙁 Is it a bandage? Ughhhhhh, that pun is killing me. I hope this isn’t going to be an ongoing joke now, that you can make bad puns x__x. Nice job guys really funny! Been hooked on your comic since I stumbled upon it when the “Venom symbiote + Wii = PS3? comic was up, and look, I’m finally commenting!! Wow, I think that’s a new record for Grave Risers, over 100 comics. So, what is the currency for the SMW castle price? I can’t tell. Love the ‘Bajillion Bells’ reference, NCG. Also, how do you have one and a half dragons? That’s pretty witty, I like it. I especially like what you picked up us currencies and while it might be obvious, it’s still a nice touch. Not quite, there’s a difference between Baby Bowser and Bowser Jr.
Baby Bowser = young version of Bowser. We saw him first in SMW2-Yoshi’s Island. Bowser Jr. = Claimed son of Bowser. So the 1.5 dragons (is that what they are?) would be Bowser and Bowser Jr.
Im from Germany and hate it to wrigt in english, so please dont lough to hart becouse of my writing. So, “i rise of my graves” (or whatever) to say that on guy at the ather part of the World (me) realy like your Comic and have a great time lissen the Podcast. This is Zoltan, I have RISEn FROM my GRAVE and am pretty pissed (for lack of a better word that shows my anger). I have been a reader for a looooooooooong time, have gone through all the archives when I first started and even took the time to listen to all of your podcasts (collage gets boring between classes). I was thinking of the right time to post a comment since I’m not someone who goes to a lot of forums anymore. At first I was going to post when I read a exceptionally funny comment, but I then realized that that’s what everyone else was doing so decided to take your advice and do it when I read a comic that was exceptionally horrible, and BINGO! This has to be the work comic you guys have ever done, second to the Mario steroids comic. The only thing that puts it on top is that this one has a ton of text you have to read for nothing, no punchline at all. It feels like you had an idea but was rushed to write down a bunch of “gags” that in the end don’t really add up to a good or even decent comic. If I wanted to read text during the entire comic I’d go read CTRL-ALT-DEL. The worst part is that you obviously put a lot of work into this one so sorry you wasted your time on this bad comic when you could have been doing other things… like…um… *runs away*. In the end, great work on the site guys, you’re now my favorite web comic since VGcats seemed to have been put to sleep, and keep up the great work on your podcast and comics, its just that this one just sucked. Great but why isn’t the hyrule temple there? It is a great piece of land and is only attacked every other year. Also it comes with cake. What Zelda game has cake? Don’t forget about Link’s Cakening, Wind Baker, Minish Cupcake, and Spirit Tarts. And there’s always Petit Four Swords (OK, I admit I got that one from Wikipedia). An excellent comic guys. I really loved the huge number of jokes hidden within it. A brilliant job under-exaggerating the problems with the “Hot tubs” in Bowser’s castle. Eh, it was ok. Decent puns galore, and some of the currencies made me chuckle, but overall, just not a ridiculously funny comic. It made me think, “Oh, that was clever.”, not laugh. I would love to live in Bowser’s castle, too bad i have to give up the princess I’m hiding in my basement. a. Why is the house upgraded again at purchase? NCG guys. 1 bajillion is excellent. Nice comic guys! It was pretty simple, but pretty clever. I love the “No Yoshis” sign on Bowser’s Castle. I always thought it was weird that Mario would just leave his faithful Yoshi outside in Super Mario World. I call dibs on Luigi’s Mansion! I’ve been looking for a house! I’d invite you guys over when I get it! a. It’s a flip and recoloring of the house from Tom Crook (at least it looks like it is), so of course it’d be the same. b. I thought we covered this back at Tom Crook. That isn’t grass, it’s the tiles that are around your house. You know, like this? b. The tile doesn’t look like that, nor does it extend that far. That was my point last time and it still holds. And just to clarify, I’m not criticizing the art here, I’m just saying I thought it was kind of funny, this time and last time. My god, you guys out did my pun comment last weak. Shiz…Well… Looks like I’m going to have to throw in a suggestion here. A pokemon mansion add. That’s right, a mansion in the pokemon world. You’ll mew over this property! It has fourteen bedrooms, and two are about to be added! Only one room may be original, but each room added comes with enough changes that’ll you’ll be suckered…I mean anticipating for each new addition! There’s even a secret room that was said to host illegal Houndoom fights! You’ll yell Pika at the fact you’re home comes with it’s own electric pokemon generators! That’s right, instead of you slaving over bills to pay, this assortment of Voltores and Pikachus will slave for you! Plus, you’ll get to see all new faces, whether they be excited to face the Elite 4 or crushed in defeat! Please note: We do not cover any damage cause by a giant bird of fire. What happened to the previous owner? Sorry, “previous comic”. Not “previous question”. Great comic guys! Loved the little jokes in there. I… can’t think of anything witty to say. Yes, reference to Link’s Awakening!! Loved that game, first game I ever played, and truly great. It’s too bad everyone seems to forget it because it was on the Gameboy. Yay, Luigi’s Mansion, too! Good game, too bad tons of people didn’t like it. Obviously a lot of effort put into it, and it comes out well. Redeemed. You’ll slide this time. Isn’t the mailbox for the AC house supposed to be on the other side (the left)? Is it just me or is Luigi’s mansion on a pedestal land formation? One thing I would have done is given Bowser’s castle two dungeons…That way it could have dungeons and dragons, or is that too geeky for you? HEY! I was supposed to notice that! I guess you could still mention Rouge, though technically I already stole that thought. was that a reference to link’s awakening? Man, I loved that game. first zelda game and still my second favorite. oh yeah, and the other ones were pretty funny too. That’s okay, I complained about the grass-tile already. Hahaha! I understand the first one fully now. It’s 48 Square Tiles because the screen is made up of 8×10 tiles, however since there’s a border that takes up 2 tiles each, it’s really 6×8 which is 48. Very clever. I’m not talking about the pun in his comic, nor the art… no, what bugs me about this comic and others like it, is the inclusion of a signature! Although you addressed this in two of your podcasts, you were speaking about not putting your signature on old comics. This and others like it are NEW COMICS. Come on Ray! It’s your work, don’t sign it. There are currently I can count 98 Comics in which Ray does sign his own work. Ray, you even signed a totally black panel in comic 79, I mean come on. Is it pride? That you’re using mostly text (although there are drawn comics you also sign.) Stop taking credit for your work, for better… or for worse. Ray [signing,not signing] his comics now a 2PStart meme. They killed the Rouge thing with the last podcast, NCG has been fading out and ‘this comic used to be funny’ only used to be funny. Technically I “Rose from my grave” last week but I got no shine on the podcast so like a Phoenix I rise once more. The comic is meh, I love the art, love the writing but you force effort upon the reader this week that I have to say many don’t like having done. This is like a comic gold mine for the O.G. Nintendo fan, but will more than likely just leave others confused and bored as the joke will seem like more effort than it’s worth. Keep up the good work gentlemen, and Ray would you hurry up and accept my Live invite, Tim did, tell him Tim! This is brilliant, my favourite comic by you guys yet. Works in the right amount of humour with videogame awesome…icity. Both the Mabe Village townhouse and Bowser’s Castle look pretty good. What’s the exchange rate between rupees and Peaches? No no no, get it right. It was “This comic used to be good“. Anyhow, NCG ( 🙂 ). I love comics with all sorts of easter eggs and this one fits the bill. I got 3 of the 5, so that’s a good ratio. What’s the mushroom from? While I hate to rain on a parade of good comments, I gotta say, I just wasn’t impressed with this one fellas. Yes, there are lots of ‘cute’ references to both the games invoked as well as past 2PS comics, but that was about it. The descriptions of the locations was a little amusing, to consider how they might been seen/described in a real world setting. But the comic was a little slow. Obviously, with a setup like this, there can’t be a definitive punchline, and that inherent changes the intent of the comic. From one of ‘guffaw’ to that of ‘giggle’, so I admit that it merely different from what we typically think to see. Other than that, the pacing (if it has any) felt slow to me. So much text, so much scrolling, and without a big payout at the end. But, not one to end on a sour note, the artwork is as great as ever, and I give you guys a solid ‘B’ for concept. Looking forward to the next one. Sorry, miscounted, 4 of the 6. Anyhow, NCG ( ). I love comics with all sorts of easter eggs and this one fits the bill. I got 3 of the 5, so that’s a good ratio. What’s the mushroom from? Super Mario 3. The little Mushroom huts with 3 chests to choose from. Why wouldn’t the border count? I could see if it were trees or something, but from this screenshot you can see that there aren’t that many trees. Anyway, is it the size of the house or the land? Because I would imagine that if it were the total land, the Ice Climbers would probably be 1000000 square feet instead of only 1, unless somebody else owns all of the snow around the igloo. And I was expecting the logo to be a “For Sale” sign in front of the normal logo, but I guess this one’s OK too. Sort of a play off of how it’s already a button. I approve. Anyone notice how Luigi’s mansion looks like a face? 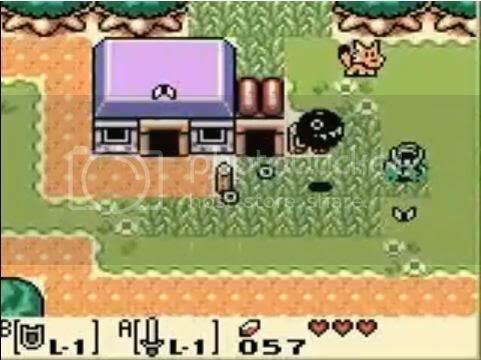 To get specific, I’m guessing the Link’s Awakening house is the one with the Chain Chomp outside? That’s how it looks in Brawl. Just like the sky in the Ice Climber igloo is from Brawl instead of Ice Climber. I made the same mistake as you… but when you go INSIDE the house, then the house fills up the whole screen, and the game boy screen (Links Awakening) holds 8×10 tiles that link can be standing on at a time on the screen, and when you’re in the house, that’s the whole screen. Doh! I can’t believe I didn’t think about the inside…wow. OK, I guess 48 is right then. I love all the little jokes and puns in this one! I’m sure if I go through it again, I’ll find a bunch that I missed the first time. And you’re right about the 2P start popularity chart. This comic used to be funny about 2 or 3 issues ago. Which is what made it so awesome. Still going strong 110 comics later, despite getting all unfunny after only 7 strips! Last I checked, they were Koopas, not dragons. I always thought Koopas wer some sort of turtle dragon species, so it still fits by my reckoning. Actually, I’m siding with tustin on this one. Sure, that’s not what the original comment said, but I think that most of the time it was referenced, it was “good”. Even though the original comment said “funny”, I’m pretty sure the running joke was usually “good”. Ah, you know, that first one looks really quaint. Maybe my Chain Chomp and I will finally move out of the Mushroom Kingdom. Looks like there’s a lot of space for my little BowWow to fruitlessly flail about. I know how much he loves being tethered to a wooden post. … and you call yourselves Animal Crossing fans. tch. I’ve come to realize that I’ve kinda been showering you guys with the hate, something I mean to clarify. If I didn’t like your comic, I wouldn’t post at all. The reason a lot of my posts are not praising, is because those are the times when I think that you guys could’ve done more, as the past comics have showed you are capable of. Just wanted to clear that up. I mean c’mon, youre living with your mom, theres only one bedroom and no bathrooms..
Don’t we still have The Swimming Pool of Money? Who needs new memes when we can reuse old ones that don’t apply to 2P START? KABOOM AND THE STAIN IS GONE! …And much more, but if you call now, I’ll give you another beating…ABSOLUTELY FREE! If you can guess were most of these come from, you win a prize! The odd thing is I thought you were joking…then I read your comment again and thought back to the GC Animal Crossing (Which Ray apparently based this particular house on) and the mailbox is in fact on the right. I’m too lazy to log in, so I’m doin’ it the e-z way! Anyway…The Swimming Pool of Money is shutting down in June because of Tim’s baby. It’s going towards diapers and college now. D3vin, I think all of them found popularity on 4chan. I didn’t really want to comment again but the 4th is from the sonic episode where he tells people that sexual harassment is no good x__x…. Oh sonic and mario cartoons. Oh and quick post, the last isn’t cilit bang, but from Billy May’s (and now the more popular Heavy Weapons guy Dub of it) Kaboom cleaners commercials. Just want to say, but sadly this is another week where I am not bowing down. I like all the variances in the entries… Great job!